Wimpel! 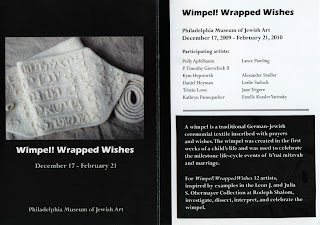 Wrapped Wishes is on exhibit at the Philadelphia Museum of Jewish Art through February 21, 2010. It features work by Polly Apfelbaum, P. Timothy Gierschick II, Daniel Heyman, Tristin Lowe, Kathryn Pannepacker, Lance Pawling, Alexander Stadler, Leslie Sudock, Jane Trigere, Estelle Kessler Yarinsky and me. The exhibition was organized by Matthew Singer and Wendi Furman. Click here to read a review and, if you're in Philadelphia, stop by and see the show!